Looking for a particular item? Need help selecting a gift? Want some quick tips for cleaning jewelry? See a design and wondering if it can be modified? Interested in a custom design? Looking for a personalized calendar gift? Start here with the following help & services. Use the Google-powered search bar below to search the Of Good Cheer site for items matching your desired specifications; for your convenience, there's the option to check the web at large for the same search specifications. For cards, try an occassion like birthday or graduation, specific holiday like Halloween or Christmas, or category like thank you, congratulations or blank cards. For jewelry, try combinations of materials and item type (necklace, earrings, bracelet) and/or dimensions (16", 7" etc). Selecting a gift that expresses your care and thought can be a challenge, and the following questions are posed to help you narrow down selections to a product that might work. On the safe side, don't forget the returns policy. If the gift is not suitable, the item may be returned or exchanged for another piece. Does the recipient use greeting cards and/or wear jewelry? This may seem obvious, but it raises a very important question of how your recipient will receive a card or jewelry gift. If the person doesn't send cards or show interest in cards, then it's doubtful these cards will change his or her mind! Likewise with jewelry: if your recipient wears only fine jewelry limited to precious gemstone solitaires or studs, then there's a good chance this jewelry won't meet her or his expectations. I want our products to have happy homes, not be met with disappointment. Does the recipient send or forward humorous emails or images? Chances are, if he or she passes along funny images, cards with a humorous twist may be a nice alternative. Try one of the Val's Pals or Had Matter Line card samplers. Does the recipient own and use a quality digital camera? Photographers tend to like photographs; he or she may be able to take as nice or nicer photographs than offered here, but you know the saying: a bird in hand is worth two in the bush. It may be nice to recieve some cards with interesting images simply to have them in hand. Try one of the River Stone Designs card samplers. Does the recipient prefer gold over silver jewelry? The bulk of Joie de Vivre jewelry uses sterling silver; it's an attractive, durable metal that provides a modern, quality look for an economical cost. If the recipient prefers gold jewelry, there are jewelry designs with 14kt gold-fill components. (Gold-fill is a much thicker gold layer over a base metal than gold-plate.) See the gold material link or enter "14kt gold fill" in the search bar above for a broader site search. 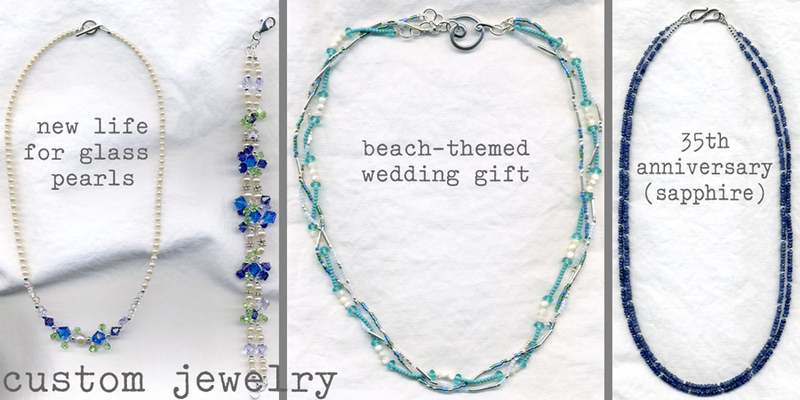 Does the recipient prefer pendants over beaded jewelry? This is a variant on the original question; what kind of jewelry does the recipient prefer? Necklaces with pendants tend to be simpler in design, and they are often used to accent colors or design elements from an ensemble. Pendants are focal elements that draw the eye so care is needed when selecting both the length of the necklace and scale of the pendant to ensure the pendant rests comfortably and has pleasing proportions. A small (1" or less) pendant on an 18" "princess" length chain or necklace is flattering for most women; hence, this combination is very popular. The 20 Under 30 page offers 20 jewelry pieces under $30 USD that meet this description. There's also the Sub 60 page with a variety of jewelry pieces under $60 USD, mostly necklaces with gemstone pendants. If you're feeling more daring, larger pendants and necklaces can make bold, striking accessories that are fun to wear. See the Cool Finds page or the Yes I Koan page for ideas. Is there a special moment to be celebrated? The Gift Center offers packages from as little as $20 USD to commemorate a special event. Try the Something Special page for jewelry items celebrating special moments, including the everyday! I'm happy to create custom work for a one of a kind treasure. I've made new jewelry items from older, broken jewelry and designed pieces based on a customer's gemstone choice and basic style. Special family memories, like a new member of the family, reunion and graduation, are captured in digital pictures but unfortunately can languish in the great stack of "things I mean to get to". I can help! I can create a 30-day calendar stack with both my graphics and your pictures to save and share the moment in tangible form. See the gift center for examples of calendar stacks, and contact me if you are interested in creating your own custom stack. When jewelry pieces are looking dingy or tarnished, it's relatively simple to restore them to their full shine. Hand wash beaded jewelry and precious metal jewelry using warm water, a mild soap and gentle rubbing motion between the palms. I like using baby shampoo for its neutral pH and nice smell. For stubborn tarnish (especially on silver), you can try using a soft toothbrush with some silver cleaner followed by the wash. Lay flat to dry and enjoy your refreshed jewelry! See the Joie de Vivre jewelry care page for full instructions for care and cleaning.